I feel embarrassed to say these are not even half of my collection. The Lomography cameras, Canons, some Minoltas, and some of the Polaroids are missing from this collage. I've accumulated camera's over the years, spent countless hours thrifting, ebaying, craiglisting, pennysaving for inexpensive and great working cameras and when I married, I was finally able to give them a proper exhibit. I was introduced to them years ago by A., and when I like a hobby, I go to extremes. This hobby has stuck and has not stopped. Plus, this hobby makes me go outside. 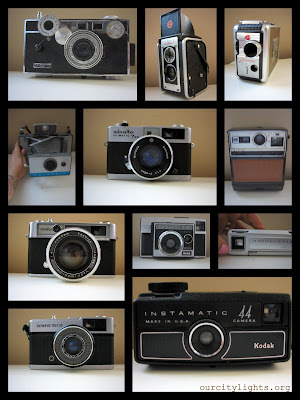 My favorite one in this collage is Yashica. 35mm film to be developed soon. Funny that I have the crappiest digital camera, but when it comes to analog, I'm willing to pay a pretty penny. I'm not a great photographer, I'm not even good, I just love the structure of an old camera. They are beautiful and an amazing invention. These are all working cameras, even the Brownie and the Land Polaroid. But the film is as expensive as the camera itself. You guys can appreciate a beautiful collection, and I'm glad to share these with you.